LG is one of still relatively few manufacturers willing to dip its toes into the world of IDTVs with built-in Freeview+ PVRs. 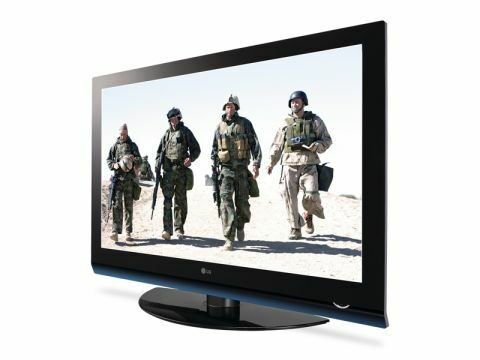 Its latest effort is the LG PG6900 range comprising 42in and 50in models with 160GB hard discs. Sadly, it is a little disadvantaged by having a 1365 x 768 resolution, which limits it to displaying hi-def in 720p quality only – a shame when so many HD channels output in 1080i. Design-wise, it's not ultra-slim but still svelte at 3.2in and quite designer-looking with a primarily black bezel that slopes away at the bottom end where it is coloured in a subtle shade of dark blue, and sports a fetchingly designed power button. The elegant semi-circular stand can be unscrewed enabling the TV to be wall-mounted. A CI slot sits along the left side and the connections include three HDMI inputs and component in. Compared with the TV the lengthy remote is rather pedestrian and suffers from the common complaint of having too many small buttons. There are two digital terrestrial and one analogue tuner but it's not possible to record two channels at once, just one while watching another. The EPG can be set to show eight days of Freeview data in advance displayed as a grid of six channels, or now-and-next data only which can be browsed day by day. Here, you can set reminders and schedule recordings in advance. You can call up a pop-up menu that asks if you want to record the whole series, just the programme, or set a reminder. Alternatively, jabbing record twice creates a series link. There's a 30-event manual timer for scheduling TV and radio recordings as well as those made 'in composite quality' from external Scart-connected sources such as a receiver. You're notified when TV clashes occur and, if available, the PVR will suggest an alternative time to record one of the shows involved. For internal analogue and external recordings you can choose from two quality settings. 'High' enables you to store around 48 hours and 'standard' stores 68 hours. Overall, the panel's 100HZ processing prowess does a good job at delivering smooth results from fast-moving images. But live/recorded pictures from the internal DTT tuner are a little blocky – especially blown up on a 50in screen. Analogue recordings made in high quality (including from an external Freeview box) are faithful to the source but standard ones look predictably soft. You can watch a recording from the start while it's still being recorded and timeshift aided by a progress bar. You can fast-forward and rewind at five levels of speed indicated by arrows or skip back and forth in little jumps. Although Freeview SD pictures are a mixed bag, 720p results from our HD DVD discs of Serenity and Blood Diamond were impressively sharp, the built-in demo of the TV's XD engine processing enabled us to see how much brighter they were as a result while retaining solid black levels in darker scenes.